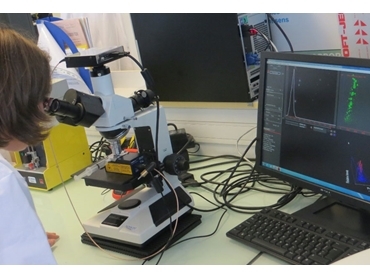 Particle & Surface Sciences reports on the latest news from Nanosight UK, on how Nanoparticle Tracking Analysis (NTA) is being employed at French company Santen SAS to use different nanoemulsions for applications in the treatment of the human eye. Santen is a Japanese pharmaceutical company specialising in the development and manufacturing of ophthalmic products. Santen SAS, located in France is the innovation centre of Santen Pharmaceuticals where the company incubates high technology projects. Dr Jean-Sebastien Garrigue, Research and Development Director leads a research team to develop ophthalmic pharmaceutical products based on innovative drug delivery systems, specifically nanoemulsions. The company applies a technology platform for topical delivery on the ocular surface with Novasorb cationic nanoemulsions. They also work on a treatment known as Eyeject, a neutral nanoemulsion that can be injected inside the eye for the treatment of retinal disease. Describing his work and his use of NTA, Dr Garrigue said that they were constantly looking for new particle characterisation techniques. The NanoSight nanoparticle tracking analysis instrument met their need for more accurate equipment to measure the size of their nanoemulsions, to distinguish the different populations and to link the size of the nanoemulsions to their biological efficacy. The NTA also allows them to count nanodroplets in a sample. According to Dr Garrigue, the NanoSight instrument allows them to fine-tune their measurement more accurately than with the old equipment. PsS currently offers a NanoSight NS500 for laboratory analysis and site demonstrations, and distributes NanoSight products throughout Australia and New Zealand.